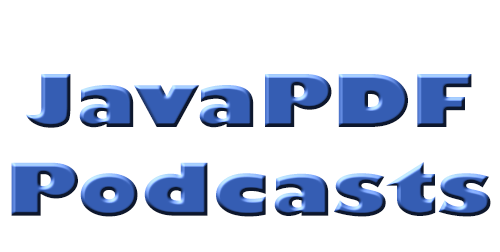 Welcome to the first Java PDF Podcast for 2014. Java PDF Podcasts is back! In this series of Podcasts we shall be taking a look at a specific theme that alot of us have needed to go through to find a job. We will be talking about Job Interviews, our experiences and providing tips and tricks with which to help you prepare for these Interviews. Over the course of the next few weeks in these Podcasts we will be interviewing various members of the IDR Solutions team to learn about their experiences. In our first Interview we talk to Mark Stephens, the lead developer and system architect at IDR Solutions and we catch up, get a sneak peak at the new Java FX enhancements and also learn about Marks Interview experiences and what advice he has to offer to others. Download the Podcast (8.20 minutes) to listen offline, when your busy or when your on the move. Subscribe and Listen to us on ITUNES.